Contrary to what was posted on the website on Wednesday in the course notes, Sprint Rules are in effect for this Saturdays race at Shoreline Community College. Most importantly this means high walls and fences are illegal to cross, even if you are physically able to cross them. This is an international rule, and is in place to ensure a fair and safe race course. Also please remember you can not go through flower beds or planted areas marked in olive green on the map. Runners can be disqualified for violating the sprint rules. Shoreview Park and Shoreline Community College is a great area that is one-half traditional forest/park orienteering, and one-half campus/sprint orienteering. You will need to be able to switch gears as you move between the two types of areas. All of the courses will visit both the forest and the campus. The forest area is hilly with a fairly dense trail network and vegetation that varies in thickness. The campus area is complex with many buildings (much more complex than Hamlin! ), but flat and it can be very fast, if you can navigate quickly enough to keep up with your legs! In the campus area, it will be especially important to read your control descriptions, since controls may be tucked away where you can’t easily see them. There are lots of controls out there so be sure to check the number before you ‘punch’. The map is in excellent condition, thanks to being recently updated for SART (thank you Patrick!). There are some permanent ‘out of bounds’ areas (marked in olive green), as well as some temporary ‘out of bounds’ (marked with magenta stripes) protecting newly planted areas and steep slopes. 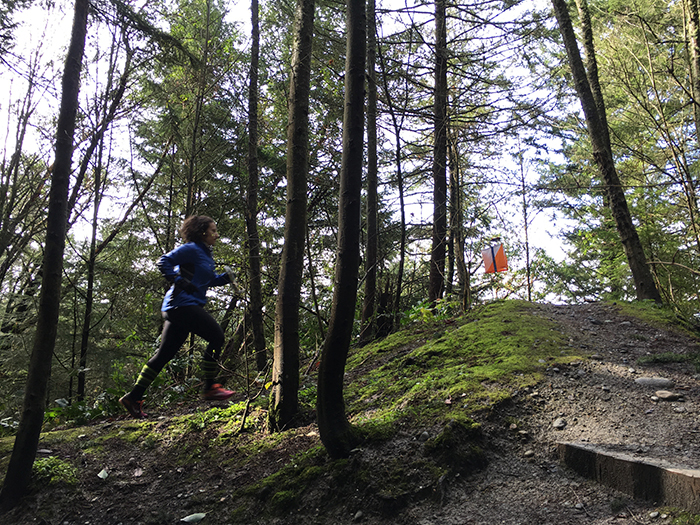 Near the start, there is an area in the forest where you must stay on-trail; this is marked by magenta stripes in the forest but not over the trails. Please respect the marked ‘out of bounds’ areas or you will be DQ’d. On campus you may encounter landscaped areas that are not marked ‘out of bounds’ but please be a good neighbor and avoid trampling these areas. You may encounter some yellow caution tape stretched across a grassy area and path between two buildings, depending on route choice. This is most likely on Intermediate, JV Girls, and Middle School. You may go under (or over) this tape, there is no danger. The Long Advanced course will have a map flip. Once you reach control 16, flip the map over and continue. The event will use sprint rules. In addition, all trails in the forest are mapped in varying thickness of black dashed lines, not solid brown. Students with a season pass, use the button above to RSVP for this meet by Tuesday November 27 at Noon. Online pre-registration closes Thursday November 29 at 9pm. Day-of-event registration is by cash or check only. Park at the college, not Shoreview Park. You can park in any of the college parking lots. Registration is at the north end of campus, near the track/soccer field and building 2500. Please do not park in the off-leash dog area parking. As a training exercise or a short physical and mental warm up, two short Micro O’ will be set up near Registration. 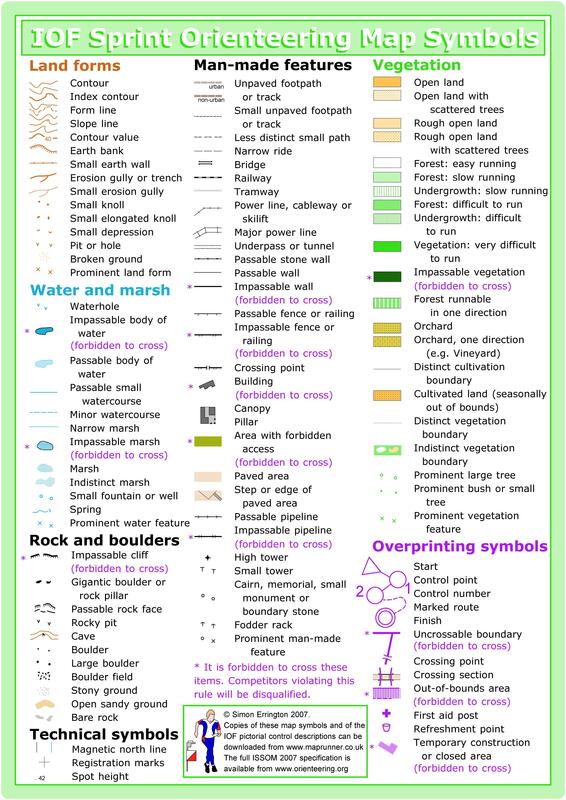 This will be a self-service activity and you will need to print your own maps [2018 Shoreline Micro O] and description sheets [2018 Shoreline Micro O-descriptions]. There is also a brief write up on how to use Micro O’ to practice “flow” [Micro-O-How-To 20180214]. The courses were not field checked so there might be minor discrepancies. Be very careful around moving people and vehicles! If you have questions (or suggestions), please see Mike Schuh – he’ll be working the first shift of Beginner Instruction somewhere near Registration.